Luke 19 is the nineteenth chapter of the Gospel of Luke in the New Testament of the Christian Bible. It records Jesus' arrival in Jericho and his meeting with Zacchaeus, a parable and his arrival in Jerusalem. The book containing this chapter is anonymous, but early Christian tradition uniformly affirmed that Luke composed this Gospel as well as the Acts of the Apostles. Luke 6:4-16 on Papyrus 4, written about AD 150-175. This chapter is divided into 48 verses. Zacchaeus by Niels Larsen Stevns. Jesus calls Zacchaeus down from his height in the tree. 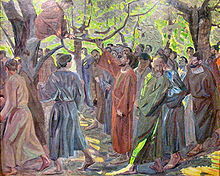 Zacchaeus (Greek: Ζακχαῖος, Zakchaios; Hebrew: זכי‎, "pure", "innocent" ) of Jericho was wealthy, a chief tax collector, mentioned only in the Gospel of Luke. A descendent of Abraham, he was a poster child for Jesus' personal, earthly mission to bring salvation to the lost. Tax collectors were despised as traitors (working for the Roman Empire, not for their Jewish community), and as being corrupt. Behold before thee the compassionate King, amidst the very shouts of joy raised by His disciples! Jesus weeps over Jerusalem, and yet compels no man by force. See also how Jesus wept at the death of his friend Lazarus (John 11:35). [Jesus] Saying unto them, It is written, My house is the house of prayer: but ye have made it a den of thieves. Jesus' words draw from both Isaiah 56:7 (a house of prayer for all nations) and Jeremiah 7:11 (a den of thieves) in Matthew 21:13, which is a parallel verse to this verse and Mark 11:17. ^ Halley, Henry H. Halley's Bible Handbook: an Abbreviated Bible Commentary. 23rd edition. Zondervan Publishing House. 1962. ^ Holman Illustrated Bible Handbook. Holman Bible Publishers, Nashville, Tennessee. 2012. ^ Kirkpatrick, A. F. (1901). The Book of Psalms: with Introduction and Notes. The Cambridge Bible for Schools and Colleges. Book IV and V: Psalms XC-CL. Cambridge: At the University Press. p. 840. Retrieved February 28, 2019. ^ Milligan, Jim. "Lexicon :: Strong's G2195 - Zakchaios". Blue Letter Bible. Sowing Circle. ^ Warfield, Benjamin Breckinridge. "Jesus' Mission, According to His Own Testimony". Monergism. CPR Foundation. ^ Huey, F. B. (1993). The New American Commentary - Jeremiah, Lamentations: An Exegetical and Theological Exposition of Holy Scripture, NIV Text. B&H Publishing Group. p. 106. ISBN 9780805401165.